The Chinese economy continued to grow strongly in the second half of 2002 notwithstanding the US-led slowdown of the world economy. GDP increased by 7.9% in the first three quarters and is expected to reach 8% for the full year 2002. Growth was driven by both domestic and foreign demand. Chinese imports increased rapidly as well, supporting overall economic growth in the region. China¿s first year as a member of the World Trade Organization (WTO) has obviously turned out a success. 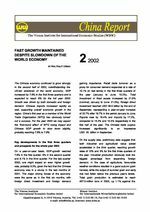 For the year 2003 we may expect the `first-round effect¿ of WTO losing impact and Chinese GDP growth to slow down slightly, probably reaching 7.6% to 7.8%.